From the seemingly never-ending battle over who gets to tap into the Mekong River with a hydropower dam to a Lao American being the first Asian American to be crowned Miss Minnesota in the state pageant history; whether good or not-so-good, it’s been quite a buzzing month for being Lao’d in the news. This Monday, the LLOTP team is feeding you food for thought in a nicely packed lunchbox of tidbits that give you important sample bites. While you dig into this freshly served news, just make sure to challenge what you read: Why are reporters covering this topic? What is being deemed important to report and what is left out? (And of course) Why should I even care? 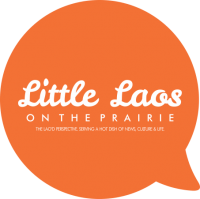 As Lao people, we are a community with stories and experiences that no one else in the general public completely understands. If what’s being covered in the media isn’t representative of who we are as a community, then we need to at least speak up, write up and stand up for what, who, how we are. 2. Lao Buddhist Temple in Westminster, Colorado caught on fire and burnt down last week with one monk suffering minor injuries and with a complete loss of the temple’s structure. The community has established the Lao Buddhist Temple Fire Relief Fund at 1stBank, a Colorado-based bank chain, and is accepting donations to help rebuild the temple. You can find the nearest 1stBank location here, or call Sy Pong at 720-210-7555 or Maly at 720-217-6142. 3. Caught in a human trafficking battle with their employers and with the promise of a prosperous future, Lao workers were lured to work on Oahu, Hawaii farms that threaten their health and financial stability. 4. The Mekong River Commission (MRC) meets today in Siem Reap, Cambodia to vote on the Xayaburi dam project. As the controversy that surrounds the dam project that is planned to be built upstream Laos continues between its bordering Mekong River countries; Lao authorities are persistent that they can persuade their neighbors why the project must continue. ….more news to be served! Next PostLike the 80's, I’m Baaaaack!